Funds raised from the Festival benefit the programs of Dragonheart Vermont and other cancer non-profit organizations in our area. This year, we are excited to help launch the new Integrative Therapies program at the Vermont Cancer Center. This program will provide acupuncture, yoga, massage, mindfulness and other therapies to cancer patients and survivors to help control pain, fatigue and other side effects while improving psychological outlook and quality of life. 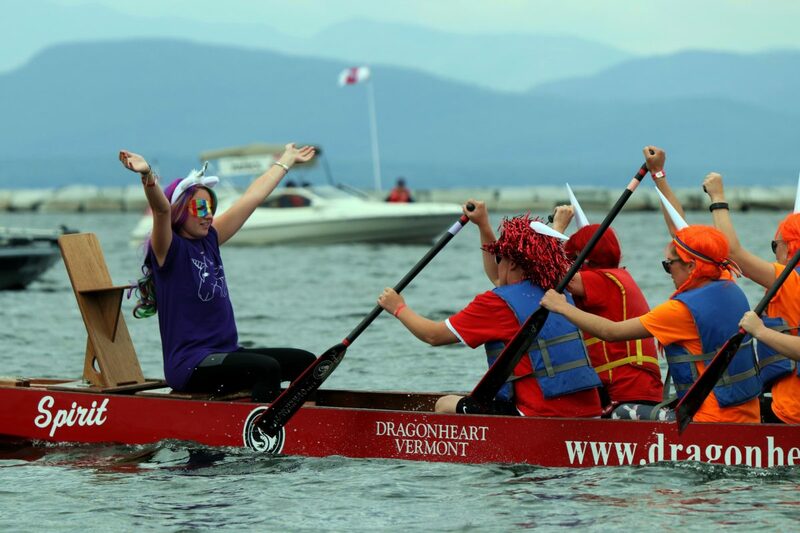 Dragonheart Vermont is a breast cancer survivor and supporter dragon boat organization that carries on year-round programs to support and empower breast cancer survivors. We also pride ourselves on the importance of breast cancer awareness and community-giving and have given back over $850,000 in the past 12 years. Let us know if you are planning any fundraising events that you would like us to feature in our social media and other communications. Never interchange the word “rowing” for “paddling.” Remember, you are paddling a dragon boat! Always, always, always paddle in sync with the lead paddlers; that’s why they’re called “the strokes”! If you get splashed, splash back. We like to keep things even on the boat. Are you a new team? Dragon boating is the ultimate team sport. There is no “I” in DRAGON BOAT RACE. The team that paddles together shines together. All egos are left on shore. The dragon boat provides an equal playing field. Muscles are nice, but they are not nearly as important as your ability to keep together. There are 20 paddlers in a dragon boat. The steersperson stands in the back of the boat to coach the team and guide the boat. The drummer sits in the front of the boat to provide a beat to help paddlers stay in time with the strokes. Everyone in the boat depends on everyone else in the boat. What is nicer than your teammates depending on one another? A win in a dragon boat race is a group win that feels 21 times better than you alone crossing the finish line! 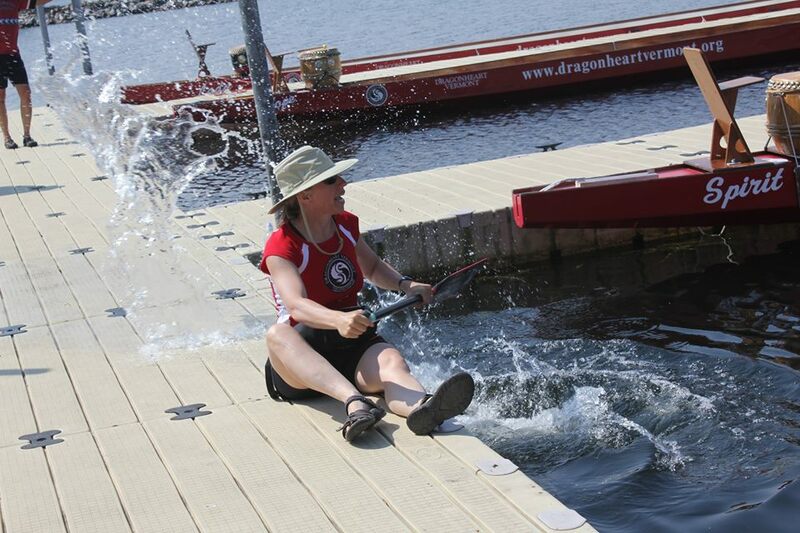 Please know that Dragonheart Vermont is so appreciative of the dedication of the people who serve as the Team Captains for our Lake Champlain Dragon Boat Festival teams. Three Cheers to our Captains! Recruit and register 16 to 20 paddlers, 1 drummer, and up to 3 alternates for your team. Serve as the leader and communicator for your team. Collaborate on a team name, team bio, team cheer or song, and team tent. Encourage your team to raise a minimum of $100 per person beyond your race fees to further the Festival charitable cause. Accept Dragonheart’s appreciation as well as that of your teammates for your amazing organizational and leadership efforts. The drummer serves a vital role on a dragon boat team. He or she is the ‘pulse’ or ‘drumbeat’ of the team. The drummer should be light weight, as he/she will be sitting on top of the bow of the boat. An outgoing personality is helpful, as is being a confident swimmer. The drummer’s role is FUNCTIONAL. The drummer sits at the front of the boat and helps the steersperson/coach communicate with the crew by relaying commands to the front of the boat. The drummer’s role is PRACTICAL. The drummer keeps the paddlers in rhythm. The drummer matches his/her drumbeats with the strokes of the front two paddlers. The drummer’s role is SUPPORTIVE. He or she will cheer on the crew and bring their focus to stroking in time. The drummer’s role is CEREMONIAL. The drummer establishes the spirit of the team and reflects that spirit in everything from their costume to the encouragement they give to the paddlers.